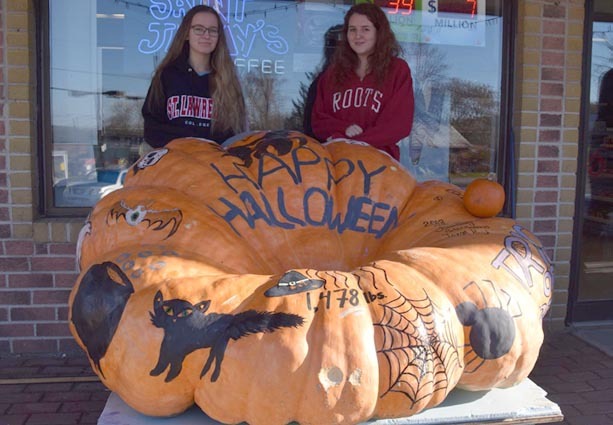 Olivia Sherritt (left) and Jillian Davey used a 1,478 pound pumpkin as their canvass for a spooky artistic creation, which can be found outside the Hilltop Variety in Newburgh. They first drew outlines of their creations and then painted it with glow-in-the-dark paint. The pumpkin was grown at Big Creek Farm in Napanee. Also helping to paint the pumpkin was Peter Medeiros and Jaxson Hugh. Photo by Adam Prudhomme.